Alfred Nicol’s Animal Psalms begins with the baseball field’s organized uncertainties, and continues on many a trajectory of animal ruminations―with the human species well accounted for―ending in the imbalance of the everyday “Nuts” around us. The subjects include the elephant, snake, sheep, skunk, bee, couple dynamics, the trials and triumphs of the ruler or the everyman. This is a collection rich in aphorisms on the bright and shady spectra of our interactions. Recognizable soliloquies with the meditative self or dialogues with the beloved are unraveled for keen insights on the human condition―deconstructing them until the knotty connecting threads are exposed. Nicol gives us a mature collection of quiet reflection, with wit and wisdom deployed through finely crafted poems of masterly formal dexterity. Dear reader, I’ve fallen in love with this book, and that will happen to you too. Read, for instance, the very last poem, “Nuts,” and read the great “How to Ignore an Invisible Man,” and you’re hooked forever. Read all the rest, these poems which have our numbers, and have his own too, that tell about our lives, and his, and the lives of snakes, and bees, and elephants, with such humor, and pity, and praise, for all of us, human and animal, in our situations. It’s impossible not to fall in love. The poet Rhina Espaillat has it just right when she says,”He uses language with a grace so effortless that it creates the illusion of having arranged itself, by itself. While the poems offer moments of ecstatic escape, they’re more often held in check by an Augustan wit, ironic humor and a touch of Baudelaire. “Youth is a cosmetic for the skull,” concludes one quatrain in “Against Beauty;” another poem, “Le Vieux Gets the Best of His Better Sense,” begins, “She warmed to me; I’ll live another day.” Poise and wit prevail in these psalms; they give us both despair inflected by light and illumination held fast by darkness. Animal Psalms goes to some dark places, yes, but the steadiness of Nicol’s hand on the tiller both formally and thematically makes you eager for the trip. When he does come into the light (imagining Ichabod Crane at his high school reunion, for example) you will delight in the words and images while also seeing even these poems as part of his larger itinerary. Order Animal Psalms directly from Able Muse Press. 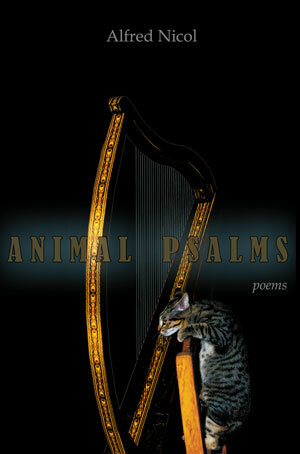 Purchase Animal Psalms at Jabberwocky Bookstore. Purchase Animal Psalms at Amazon. Alfred Nicol’s second volume of poetry is a work of extraordinary musicality, comprising song-like lyrics (“The Mistress to Herself,” “The Gift”), pensive meditations in blank verse (“Bat,” “Elegy for Everyone”) —and even the comic ragtime of “Persnickety Ichabod’s Rhyming Diary,” a narrative written entirely in limericks. Noted poet and prosodist Tim Steele numbers Nicol among the “excellent younger poets working in and carrying on the metrical tradition.” Elegy for Everyone won the 2007-2008 Anita Dorn Memorial Award for Poetry. When Alfred Nicol titled his collection of poems Elegy for Everyone, he suggested the reflective tone and thematic substance of his compilation. Its range of ideas and moods is staggering. In poem after poem the author provides a feast for the mind. The manuscript runs to seventy pages, not one of which is dull or trivial. Nicol has created a work of complex vision and stylistic mastery. If one reads his book with the empathy and imagination it deserves, one is unlikely to forget its inhabitants who are often shadows of ourselves. Winter Light by Alfred Nicol, recipient of the 2004 Richard Wilbur Award, is a remarkable new collection of poems by a sure and steady hand in an astonishing variety of forms and voices. As Rhina Espaillat remarks, Winter Light contains a “flawless ballade, a sestina, sonnets, and nonce forms that make this book a delight to read. The syntax everywhere is unobtrusively elegant; the vocabulary fresh without self-consciousness; the imagery gorgeous, precise, and persuasive; and the rhymes surprising, unforced, and ‘right. '” Ranging from the quiet lyric to the pitch-perfect dramatic monologue, Nicol transforms ordinary experiences into intriguing meditations on time, memory, loss, and the magic one finds in daily life. Contributing to those meditations are the various characters that Nicol conjures: Cocteau’s Beast, a man who believes he wills the sun across the sky each day, a magician’s daughter, a tattooed couple, and even an ibis. Yet, as Espaillat points out, “under that surface stir unquiet questions, tensions, challenges to faith, startling confessional hints, troubled memories, the sense of love gone sour and hope betrayed: a view of life not entirely sunny or simple.” These are hard-earned poems, ones that question life and, ultimately, transform our vision. It’s tempting to describe Alfred Nicol as a “poet’s poet,” because he uses language with a grace so effortless that it creates the illusion of having arranged itself, by itself. But Nicol is much more than a poet’s poet; he’s also a reader’s poet, and his work, though dazzling, is not intended to simply dazzle but to convey, with charm and profundity, the experiences of our common life. These are poems that seem to — but only seem to — reverse the famous Frost dictum: they end in the delight that the reader finds on the printed page, but clearly they begin in the wisdom that sees clearly all of what it sees, and is compelled by honesty to say so. I met Alfred Nicol when we were both young, he as a poet, I as a teacher. Back then Mr. Nicol was keen on the Beats, and I had a poetic hero or two among that diverse clan myself. How different an aesthetic Nicol shows in the splendid Winter Light, as canny and moving a formalist collection as I’ve seen in years, in a league with the likes of R.S. Gwynn; yet how gratifying that this poet’s work loses none of its early fire. The energy of youth, the wisdom of maturity: what poet could long for a better combination, the one this terrific book epitomizes? I have admired the poetry of Alfred Nicol for many years, and it was a deep pleasure to read Winter Light. In keeping with the title, poems in this collection burn with a cool radiance. Nicol is naturally drawn toward the affirming limits of formal poetry, but there is an uncanny freedom in this work — a willingness to take large emotional risk, writing about the most basic human emotions with an icy clarity. On every page Nicol exhibits a genuine largeness of spirit and grace of mind. His techniques are well-honed. This is certainly among the finest new volumes of poetry I have read in years. 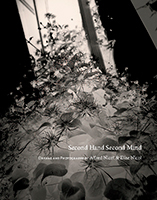 A collection of poems and photographs that sometimes pairs comedy with elegy, Second Hand Second Mind moves beyond observation and documentation to embark on a psychic journey that calls everyday truths into question while confronting the complexities of identity and loss. This is the first collaboration between Alfred Nicol and his sister, the artist Elise Nicol. The Powow River Anthology is a collection of poetry by 24 award-winning poets who are members of the prestigious Powow River Poets of Newburyport, Massachusetts. Like an oasis in a desert, this anthology offers a fertile refuge in the largely arid landscape of contemporary verse. Here readers can escape the bewildering, coercive heat of Poetry with a capital “P” and find many refreshing and memorable individual poems. Hats off to the remarkable Powow poets: long may they write and thrive. Having had some experience with the Powow River Poets, I was aware of just how good this anthology could turn out to be. It is that good. It’s not just that this group of people, as a whole and individually, is deeply talented. No. It’s that they seem to empower one another, to set standards for each other that every one of them is determined to achieve and amplify. And it’s not just that they can write, it’s that they can think as well. These poems are at once lucid and complex, thoughtful and full of emotion held in check, often by traditional craft: rhymes, meters, imagery, song. Truly, I believe that much has been lost in poetry since the rush to dump craftsmanship began in the 1950s, and the Powow River Poets are bringing it back with a flourish. For a number of years, I and many others have marveled at the phenomenon represented by the Powow River Poets. Any writer is fortunate to be able to count on the good will and expertise of even a single fellow writer as a constantly constructive reader and critic. How fortunate then are the members of this gifted group, who have clearly benefited so much from their ongoing dynamic association. The support and inspiration derived from such creative collaboration is everywhere apparent in the Powow River Anthology. It is an exemplary collection.